Defending champions New Zealand made it two World Cup wins out of two with an efficient Pool C victory over Namibia at London's Olympic Stadium. Namibia are the lowest-ranked side in the World Cup, meaning damage limitation was always going to be the aim against the All Blacks. New Zealand scored five tries before the break, before adding another four in the second half. The highlight for the African team was a fine second-half try by Johan Deysel. The All Blacks have not lost in 26 matches in the group stages of the World Cup - a record stretching back to the inaugural tournament in 1987 - and they remain on target for a likely quarter-final clash with either Ireland or France. Steve Hansen's side were often matched at the breakdown and did not produce the avalanche of tries many had predicted. New Zealand, who beat Argentina in their tournament opener, face Georgia in Cardiff next Friday, while Namibia, who are yet to win a World Cup game in 16 attempts, play Tonga next Tuesday in Exeter. 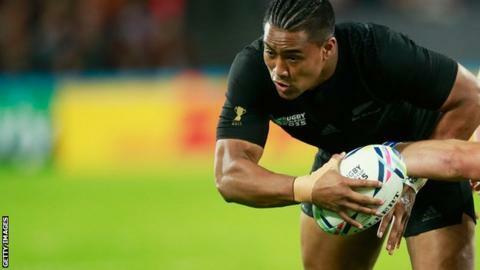 Once number eight Victor Vito had opened the scoring for the All Blacks after six minutes, strolling over in the left-hand corner after a break by Julian Savea, the writing was on the wall for Phil Davies's side. And not even Namibia's captain and Saracens legend Jacques Burger, who threw himself into the fray with typical abandon and spent most of the game receiving treatment, could stem the All Blacks tide. Man of the match Nehe Milner-Skudder crossed twice before the break and there were also first-half tries for centre Malakai Fekitoa and fly-half Beauden Barrett. Savea scored his first try of 2015 just after the restart, before Namibia, whose side is a mix of amateurs and professionals, dug in and made life difficult for the All Blacks, especially at the breakdown. Namibia were rewarded for their efforts when Deysel finished a well-executed move, bursting through the All Blacks' defence after they were caught off guard. Not even after prop Jaco Engels was shown a yellow card and New Zealand emptied their bench were the tournament favourites able to cut loose. Ben Smith, Savea and Codie Taylor added tries but the final scoreline was more evidence that the gap between the sport's traditional giants and its so-called minnows is narrowing. Although Namibia's defeat was comprehensive, it suggested they are heading in the right direction: at the 2003 World Cup they were on the receiving end of a 142-0 defeat by Australia, while they shipped 80 points against South Africa and Wales in 2011. Hansen will be wary of drawing too many conclusions from such a one-sided victory, but the performance of centre Sonny Bill Williams once again provided food for thought. After shining off the bench against Argentina at the weekend, Williams' direct running and offloading again stood out against Namibia, and his sublime offload that led to Fekitoa's try was one of the highlights of the match. Milner-Skudder, patchy against Argentina, showed he has a side-step to light up the tournament and also provided a fine offload for Taylor's try in a performance which will also encourage Hansen. New Zealand: Slade, Milner-Skudder, Fekitoa, Williams, Savea, Barrett, Perenara, B. Franks, Taylor, Faumuina, Romano, Whitelock, Kaino, Cane, Vito. Replacements: B. Smith for Slade (52), Nonu for Williams (63), Kerr-Barlow for Perenara (49), Crockett for Faumuina (64), Read for Whitelock (57), McCaw for Kaino (65). Tries: Vito, Milner-Skudder 2, Fekitoa, Barrett, Savea 2, B. Smith, Taylor. Cons: Barrett 5. Pens: Barrett. Namibia: Tromp, Philander, Greyling, Deysel, Marais, Kotze, Jantjies, Engels, Van Jaarsveld, Coetzee, Van Lill, Uanivi, Burger, du Plessis, Damens. Replacements: Botha for Philander (45), Buitendag for Jantjies (74), Van der Westhuizen for Van Jaarsveld (75), Larson for Coetzee (57), Kitshoff for Van Lill (64), Venter for Burger (66), Bothma for Damens (45). Tries: Deysel. Pens: Kotze 3.